← Ten on Tuesday, the winter fun edition. A former co-worker of Smokey's and former renter of our house had a baby over a year ago, and I promised her a sweater. 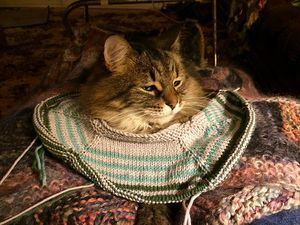 While I knit it almost immediately, it sat… and sat… and sat… waiting for the arm seams to be sewn and a button added at the neck. I finally did that last little bit of finishing a couple weeks ago and mailed the sweater off to little Abby. Luckily for me, she is a tiny little peanut and will have plenty of room to grow into it. Pattern: Baby Brights by Bev Galeska, heavily modified. Yarn: Valley Yarns Superwash DK (100% superwash merino): 25 light gray, 14 teal, 13 forest, 12 grass, 14 blue mist, 19 misty lilac, 09 wild rose, 06 burgundy. Colors are truest in the WIP photo, below left. 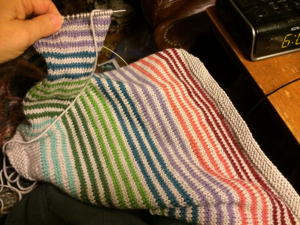 Mods: As always, I do the whole sweater in stockinette stripes, except for the edgings in garter stitch. This entry was posted in Baby stuff, FO, Sweaters. Bookmark the permalink. That is super cute! She’s adorable. Oh so cute. And impressed with your weaving in skills. I was hoping it was a self-striping yarn! Both the sweater and the baby are adorable! Well done! The sweater is great (even if the kitty looks a little unimpressed). Off to think about striped raglan sweaters for adults…! 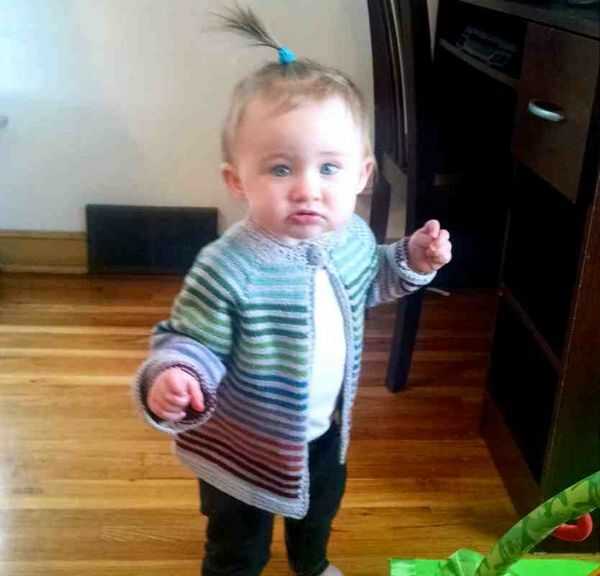 Awww … Both the baby and the sweater are soooo cuuute! I love this pattern. It’s the one I usually make (and tweak). The store I work part time at has upsized the pattern to fit up to a 4-6 child (with Bev’s permission). We always have people wanting the sweater for adults, but unfortunately, Bev didn’t have time to design that before she passed away. I see she went out and got her hair did before her photo shoot. The things you make for people–there is nothing greater. I am so in love with the cowl you made for me, still.